I don’t normally read books about true stories, I read the odd biography or autobiography but not that often. The main reason I picked this book up was because of the TV series, I loved the series and thought I’d see what the books it was based on were like as often books have more detail and I can get more into the characters. The main part of the book is 319 pages long with an additional 21 for the appendix, glossary and some references. 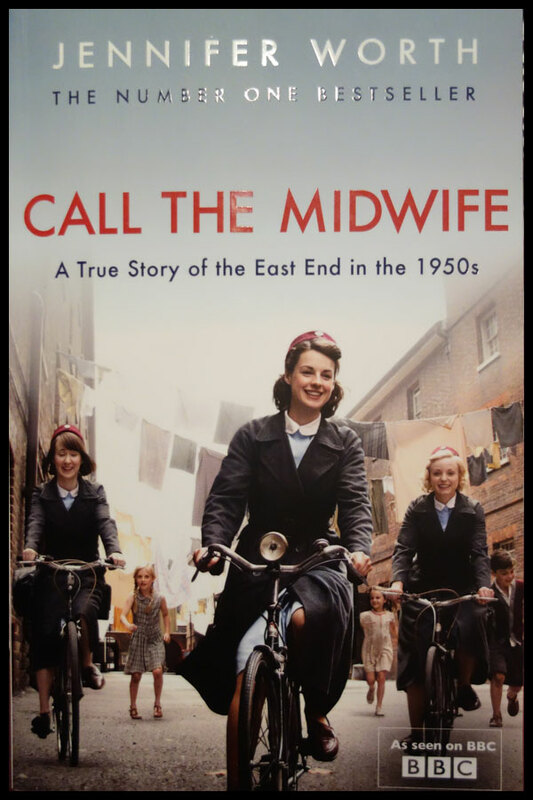 This copy of Call the Midwife by Jennifer Worth is the copy published in 2012 and uses images from the TV show. I probably would have preferred to get one of the other versions of the cover but I bought it cheap from the Works and this was the one on offer. Despite the fact this is different than the rest in the series of books because of this it still ties in with the colours and effects chosen for the photo of the cast. Call the Midwife is the first in a series of books, I think there are four altogether, which are written by Jennifer Worth, then Jennifer Lee, about her life as a midwife. This book is written about her time in Nonnatus House (a pseudonym rather than the actual name) which is a convent with Anglican nuns as well as a few young midwives. 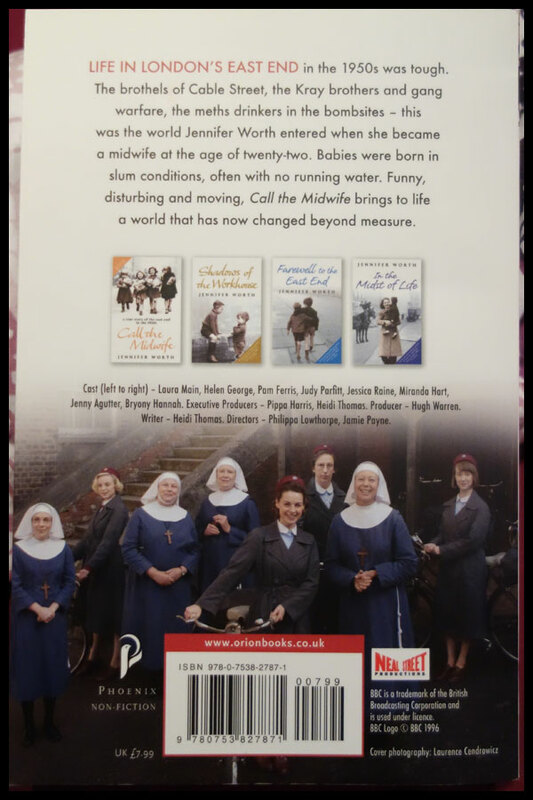 It mainly focuses on the stories of the mothers and the childbirth though there are stories about the nuns and events with the midwives, like ‘Chummy’ learning to ride a bike. I’ll try to avoid anything that could be a spoiler, though if you’ve seen the TV series then you’ll be familiar with a lot of the stories within the book. I’d say it’s one of the best adaptations from a book to TV and the TV show remains pretty true to the books. There are some times where the characters in the TV show other than Jennifer are used in a situation she was in in the books but I suppose with TV shows it’s more about the whole cast and the other midwives are focussed on more than in the book. In the first book there are mentions of them but they aren’t a main focus. The stories from the first book are spread throughout the series done so far and some of the first series on TV have come from later books so it’s not a direct translation from one to the other. I’d also say that they probably made it more family friendly than in the book. The chapters in the book are all short, the majority around ten pages, and a lot of these are individual stories. A few of them do lead into each other but most of them can be read on their own so it would be a good book to dip in and out of and read them as individual stories. The stories do jump around a bit at times rather than being in chronological order, for example the first is after Jennifer has been there a while, then the second goes back to an early case and the third chapter is her looking back from a later date again. They do all flow together well and the reminiscing makes sense and links the different stories. The description of childbirth can be pretty graphic at times so if you’re squeamish about medical things then this may put you off. There is also a time where there’s a description of inside a brothel so it’s probably not a book for younger readers, though I’m not sure it’d be a subject they’d be as interested in anyway, I don’t think I wold have been as a teenager. There’s a lot of dialogue written in Cockney with the accent, it does make it clearer about the difference between the standard English of the nuns and midwives and the accent and dialect of the locals but it can be hard to understand at first. I think reading it is harder than listening to someone talking it. There is an appendix at the end which explains about the Cockney dialect and it might actually be best to read this first. There’s also a glossary of the medical terms used, a lot of them I already knew but some of them I had no idea about so this was helpful. The middle eight pages are photos so in a glossier paper and print than the rest. I think these are a nice touch as they show the areas as they were at the time, the people and the places which have changed so much compared to today. Even if you knew the areas now a lot of the buildings written about in the books have probably gone and the dock is not as busy as it was. They do help the reader to understand the situations of certain characters in the books, as they’re true stories having something that’s actually from the time makes the picture clearer, to me anyway, rather than just imagining what the places would have looked like. Overall I really enjoyed this book. As I started reading it on Monday and wasn’t feeling great I thought I’d have to have this first book review as a two week one but I ended up finishing it in four days. I didn’t expect it to be so involving. It’s one of those books that I found myself thinking ‘I’ll just read one more chapter’ and then not wanting to put it down which is always a good sign for me. It’s definitely an easy book to read in short bursts as well as a longer sitting due to the shorter chapters and there’s nothing too challenging in the language used apart from maybe the medical terms but I enjoyed the book even without understanding them as I didn’t notice the glossary until after I had finished. The Cockney accent isn’t used too often and it’s something I found myself getting used to pretty early in the book, as I said before it’s harder to understand with reading than listening to it, at least to me. I love the way it’s written, it’s easy to understand and it’s like she’s telling the story to you face to face, it’s all very informal and a lot of it are her thoughts as well as what’s actually happening which does make you feel more included in the story, as if she’s telling you as someone she knows. Despite the fact that it’s often a serious situation there are times where it made me laugh a bit, and plenty of times where I found myself smiling either because of her sense of humour, observations or because it was just a nice moment in the story. It reminded me of the feeling you get when your grandparents tell you stories about when they were younger, the short stories can be individual or run into each other and it’s all informal and friendly and there are times where she goes away from the story slightly to explain the situation at the time so the rest of the story makes sense. I’d say it’s not one for younger readers due to the graphic descriptions but that might just be me. It’s a good book if you like true life stories and if you enjoyed the TV series and feel like reading more stories about the characters, there are a few stories in here which haven’t been used in the TV series, then this could be a good book to try. I’m definitely giving the second one a go, I’ve actually already started it as I wanted to carry on with their stories, and I think I might be getting the third and fourth ones as well. This wasn’t the original plan, I was going to read a different books next but I feel like I want to see what happens next. This turned into a longer review than I meant it to and I’m just trying out the layout with the title and things at the top, I’m not sure if I’ll stick with it but I think it works. Next book review will be on Shadows of the Workhouse, the second in this series and hopefully it’ll be next Thursday. I didn’t realize the series was based on a book! I didn’t until I saw an interview with Miranda Hart who said about it. I’m partway through the second and I’ve recognised all the stories so far in this one too.